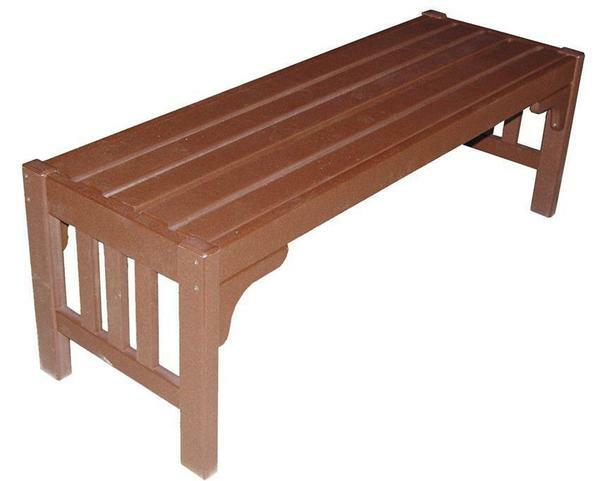 Amidst your garden or placed under a tree overlooking a relaxing outdoor area, on a porch or patio poolside, there is no right or wrong way to use our Poly Mission Parkside Bench in your outdoor decor. Crafted by hand with a classic Mission slat design, this stylish bench measures 52" wide, offering plenty of space to relax while enjoying the view. Poly lumber, a heavy-duty material derived from post-consumer plastic, offers a simple way to help out the environment while ensuring a maintenance-free bench that will last decades - even when left outside year-round. Unlike other furniture, your new poly bench will not weather and fade, or crack, splinter, chip, or rust. This stops the endless cycle of replacing furniture every few years and offers you a place that you can retreat whenever you have an opportunity. Choose from a variety of different solid or two-tone colors for your new bench to complement your outdoor decor or show off your team spirit. Each bench is made to order and delivered with care - ready for decades of continued service in your outdoor oasis. The Parkside Poly Bench is ideal for commercial use as well. The durable poly material can stand up to the rigors of constant use, while maintaining its vibrant color and beautiful appearance. Keep the maintenance to a minimum and ensure your guests and patrons always have a place to sit down and rest while visiting. Please call to inquire for larger orders. The benches arrived today and I LOVE them! They are perfect, thank you! I will keep my fingers crossed that your company comes up with a vertical stand in the Polywood!